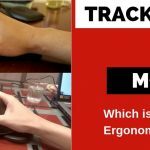 Each year, hundreds of thousands of office workers are being disabled by RSI and Motion related inquires to the hands and arms, according to an article in the New York Times. 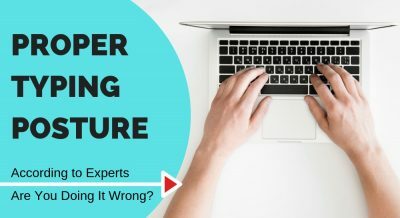 Computer users for example spend most of their time repeating the same motion such as typing at the keyboard, maneuvering the mouse, and swiping on touchscreens. These seemingly innocent gestures when done thousands of times a day are precisely what lead to disabilities such as carpal tunnel and musculoskeletal disorders. Left untreated, many people can become unemployable as a result. 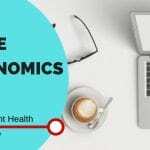 A study performed by Rempel, Kier, and Bach in 2008 paints a particular grim picture of the strains on the hands and fingers poised by the modern workplace. 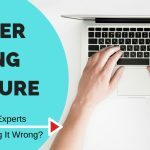 They concluded that any computer work done for more than twenty hours a week endangered the user to hand and wrist issues such as carpal tunnel syndrome. There is some evidence supporting the use of exercise — such as minor strength training, yoga, and massage — in the curing of mild RSI and CTS. According to a study by Ünver and Akyolcu in 2011 performed on Hemodialys patients with carpal tunnel syndrome, grip strength and general physical examination scores improved in approximately 21% of patients within the first month and 34% of patients by the third month. It was concluded that hand exercises such as using a exercise ball should be considered as a practical treatment for Hemodialys patients with mild CTS before other more invasive treatments are sought. 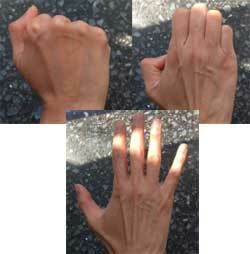 Evidence also exists to show the efficacy of hand splints and hand exercises in the treatment of CTS. In a study involving two groups of patients, statistically significant improvement was seen with CTS in both groups- one wearing a hand splint nightly for 4 weeks, the other practicing nerve and tendon gliding exercises in addition. Increasingly number of clinics, such as the Miller Health Care Institute at St. Luke’s-Roosevelt Medical Center, use a combination of non surgical procedures, including hand exercises, to treat serve hand and wrist injuries in white collar workers . 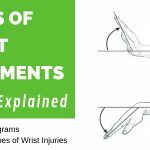 The regime includes everything from ample rest, splints worn at night to keep the patients’ wrists straight, to specific exercises that strengthen, relax, and stretch their arms and hands. 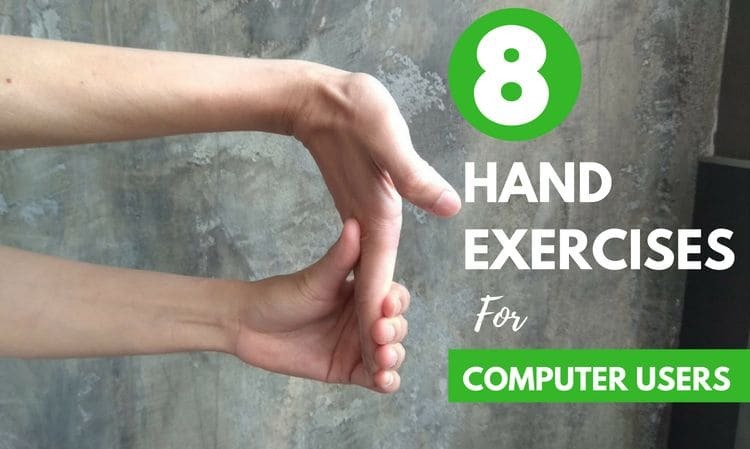 It seems for computer users that spend a lot of time of time on the computer, simple hand exercises can be effective in warding off or even treating mild hand and wrist injuries. It’s free, simple to perform, and takes very little time. 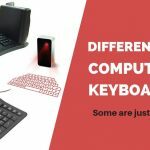 Let’s dive into 8 of the most effective hand exercises you should perform daily if you spend any time typing or using the mouse. Open the fist half way so your finger are bent at the knuckles. Hold for two seconds. Open your hands fully so all five fingers are straight and spread wide apart. Hold for 2 seconds. Re-make a fist, and repeat routine again. The Wrist Flexion and Extension Stretch is a direct way to stretch the wrist, which can help to increase blood flow to the whole area and ward off issues like carpal tunnel and RSI. 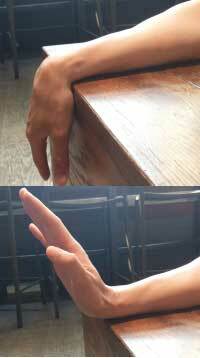 Rest your one arm at the edge of your desk, with your palm facing downwards and entire hand dangling off the edge. Cushion your wrist with a small towel if it feels more comfortable. Repeat the stretch three times in both directions. Switch hands and repeat with other hand. 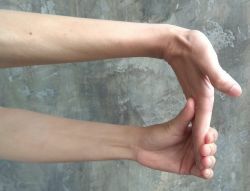 Bend your wrist downwards, with the fingers loosely closed to form a “claw”. Feel the stretch in your wrists. Then, with fingers open and loosely together, flex your wrists upwards, as if you’re a traffic cop telling cars to stop. Feel the stretch in your wrists and forearms this time. 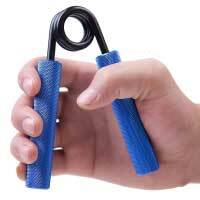 Strengthening your grip is an excellent way to increase your overall hand and forearm strength. 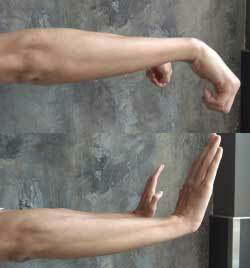 Working on your grip also strengthens your wrist muscles, helping protect it from RSI (repetitive strain injuries). Repeat for at least 10 – 15 times. Feel the stretch in your bottom of your forearm. Within the last forty years, labor has shifted from manual to technological. Those who once pulled and shifted heavy loads in factories and warehouses are now typing upon keyboards at cubicle desks. While this break from hard, manual labor is celebratory for our spinal columns, the modern day worker instead have to contend with significant pain in their hands and wrists. There is enough evidence on the benefits of hand exercises that you should start incorporating them into your daily routine. Just a few minutes a day can alleviate pain and onset ailments, such as carpal tunnel syndrome, repetitive motion injuries, or work-related musculoskeletal disorders. 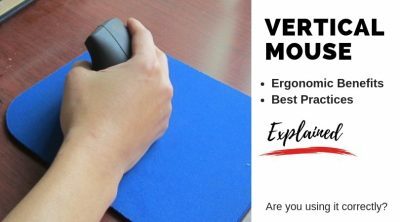 Combined with a good ergonomic mouse and keyboard, you can greatly reduce the chances of developing carpal tunnel and other crippling RSI injuries to your hands. I have a very mild case of CTS right now, and my doctor mentioned that the best way to stop it from getting worse is to stretch the hands at regular intervals. Typically, I move my hands from the wrist, and that helps. But all the other exercises you have mentioned are an excellent addition and easy to follow. 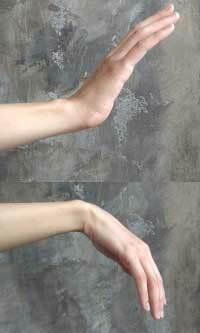 I especially find the thumb flexion and thumb touches to be very helpful. This post is just great. I appreciate how you have mentioned the time for each exercise. My hands get stiff from all the transcription work that I do and because of my age they tend to hurt more than usual. I do the basic exercises like a fist to fan and wrist stretch, but the others I didn’t know about. The new ones for me seem comforting, and stretch the hands for pain relief. Thanks a lot, Jon. This article is just brilliant and so helpful. I work a lot on the computer, and my hands hurt a lot too. I usually move them around, but it’s all random. I just tried the thumb touches and could instantly feel my fingers, thumb, and palm stretch. My hands feel so good. Thank you very much. You’ve also made a good point that we need to be proactive about this. I’ll keep that in mind. Please do a similar article for leg exercises too.